Lufthansa group, which includes Swiss and Austrian, has a very strong presence and impressive frequency at Moscow Domodedovo airport. The advantage to this is that I am able to check-in four hours prior to be scheduled departure time, after connecting in from Novosibirsk. The check-in is permanently set-up in a central location of the very busy check-in hall, so the branding and clarity of the area is strong. The check-in staff is very positive, giving off a genuinely cheerful impression for the service. Immigration is quite swift at Domodedovo, although still an unsmiling and daunting experience. Numerous thick magnifying glasses are put up to my passport, and the colleagues confer for a while, before I am stamped out. Airside at DME gives a very poor customer experience, with limited space, low-ceiling corridors and retail / food crammed into all available spaces. Seating is extremely limited and there are only a smattering of recharging points. Boarding for today’s flight is extremely quick and subtle. There are no PA announcements made and it is only when I peer up from the laptop do I realise that the entire flight has boarded. It is a very low load for the flight back to Geneva. The crew are extremely friendly on boarding, and this presumably Geneva based crew greet customers with a jolly “bonjour”. All crew are paying attention, and assisting where required. Travelling in Economy Class on an A320 which is fairly aged, at 21 years old. I am on a ‘L’ or Light fare, so no checked luggage is permitted. The weight limit is lenient in any case, at 8kg for the main item, and half that for a personal item (purse/small bag/laptop). The cabin feels very fresh and modern. The slim-line, leather seating has a very good aesthetic appeal, and the dark brown leather finishes give a suggestion of luxury. The cabin is well maintained and clean onboarding – there are the usual 2 washrooms at the rear of the cabin for Economy Class customers. Boarding is completed on-time and departure and arrival are also to schedule. 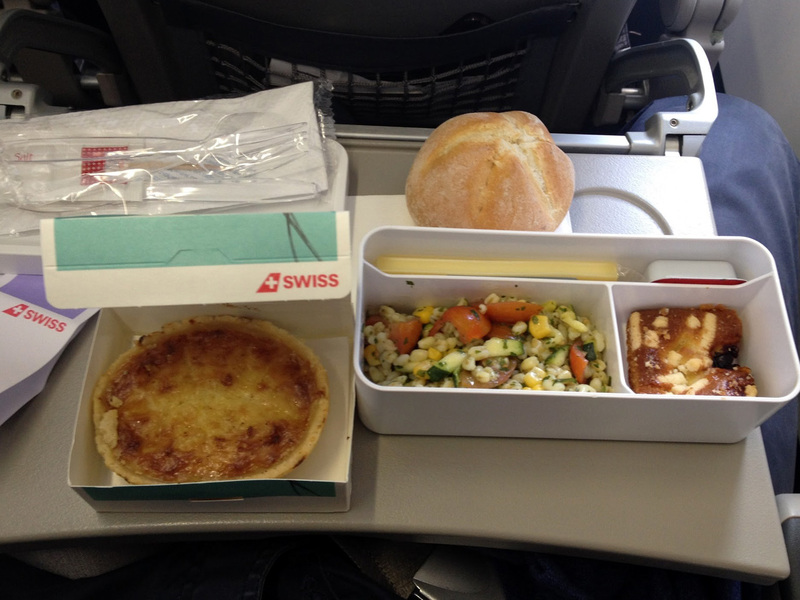 The updated Swiss meal service is excellent for this sector and quite unique. The service begins less than 20 minutes after take-off, and is very swift. Each customer is given what looks like a rigid, white pencil-case, a heated bread roll and a hot item. The packaging of the catering items is tasteful and very contemporary. The rigid white box contains three compartments, one housing cheese and a pack of butter that only just squeezes in. The main compartment is made up of a zingy, fresh salad and the last section for a tasty dessert cake slice. The neatness and aesthetic of the meal box is very impressive. The hot item is a cheese tart, which is slightly heated. It is crumbly, very buttery and appears to have been made with high quality ingredients. It is quite heavy, so overall provides a very filling meal. 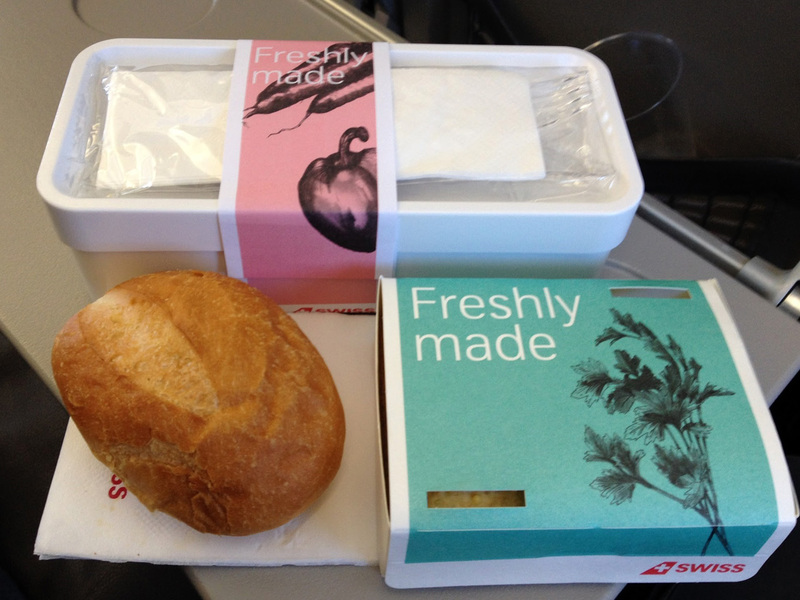 Swiss appears to be two steps ahead in its attractive meal boxes, neat artistic designs and use of fresh, appealing and simple ingredients in the economy catering provision. A full drinks service is offered, and the gin and tonic was well made, served from a miniature, using top-shelf brands. The crew apologise that there is no lemon. There is a second drinks service after the meal, but no pre-arrival drinks / nuts service before the pleasant descent down over Lake Geneva, with mountains on one side and pastures on the other. Each meal service concludes with the handing out of a nice slab of Swiss chocolate. Despite a 3.5-hour flight period, there is no PTV / AVOD for this aircraft. Instead still images from the Swiss magazine pass in a dull slideshow on the overhead screens. For this shorter flight there are no cabin comforts to speak of – however, after the meal service, staff dim the lights to create a more muted cabin environment, but do not close window shades. The service onboard today’s flight was excellent. Despite perhaps nudging across the unprofessional fine line at times (singing to music videos in back galley prior to takeoff), the staff portrayed their fun and endearing personalities during the course of the flight. There was clearly a very strong team ethos with the crew, and they assisted one another and joked with one another during the meal services. The positive feeling was quite infectious, and there were big, genuine smiles throughout. The interaction extended to the customers, and crew were happy and eager to engage in conversation with customers. All call buttons were answered promptly. Geneva offers an alternative transfer hub for Swiss customers on selected flights. The airport is much less convenient for transferring, with long walking distances. However, it boasts excellent facilities and a good customer service approach from security staff. 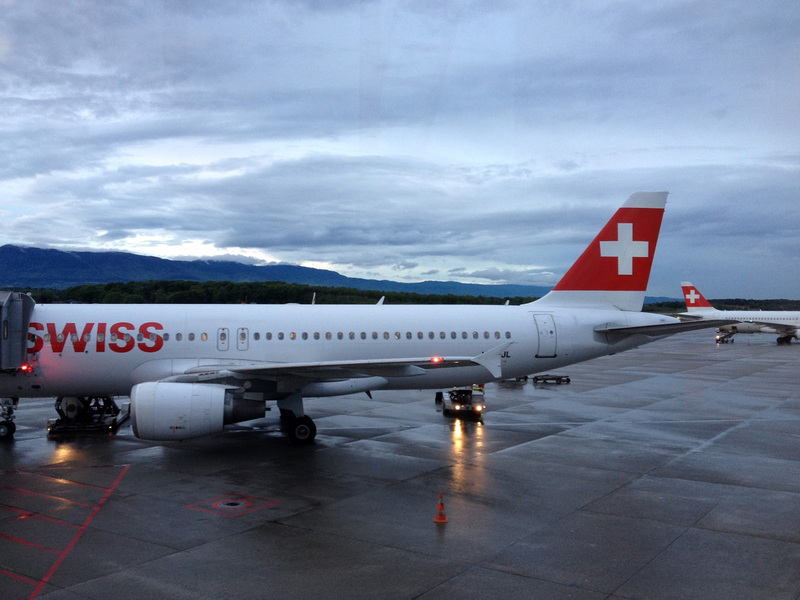 Overall, a pleasant experience with Swiss on this longer regional sector – onboard catering product stands out as the wow factor on this flight and this was supported by a very pleasant service from the cabin staff. 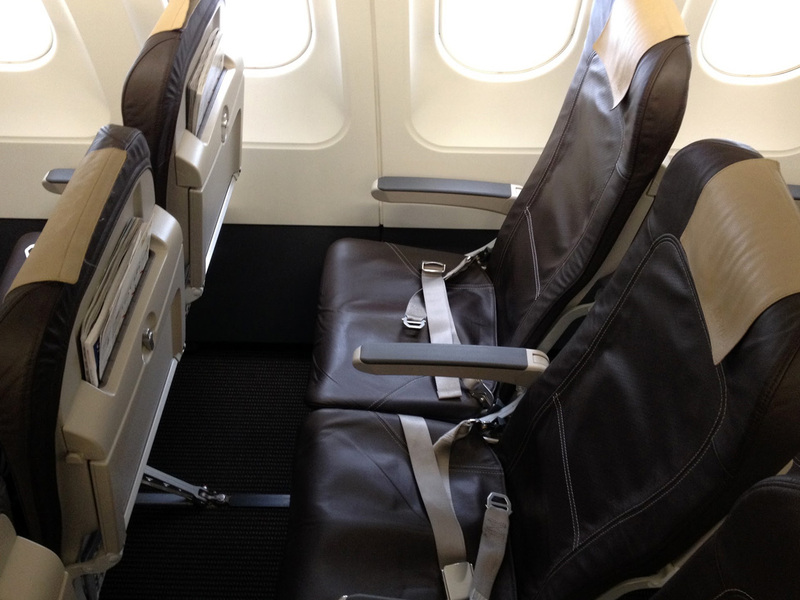 The cabin hardware is typical narrow body European standard with slim line seats and no IFE, so bring a book or your own downloaded programming. Overall, for the price paid it was excellent value for money.